Powersmile All Natural Toothpaste features an exclusive blend of natural polishers and stain-fighting botanicals, including Bamboo Powder, Calcium Carbonate, Sodium Bicarbonate (Baking Soda) and Silica, to help prevent tartar build-up while gently whitening and brightening your smile. Natural Grapefruit Seed and PeriIla Seed Extracts help fight damaging sugar acids while Natural Peppermint Oil powerfully freshens your breath. 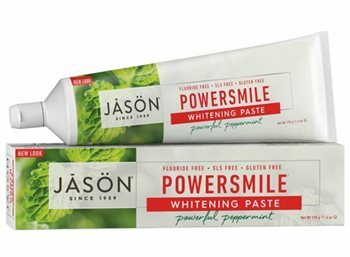 For a brilliantly white smile and fresh breath, use JASON Powersmile toothpaste and mouthwash twice a day. Exclusive Blend of Natural Whitening Polishers. Since 1959, JASON has delivered safe, wholesome, no-nonsense, natural products that really work. Our formulas don't contain petrolatum, sodium lauryl or laureth sulfates, parabens or phthalates. And we never test our formulas on animals.